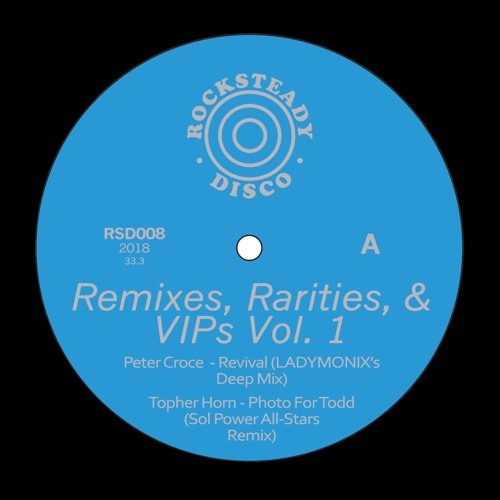 After 4 years Rocksteady Disco drops its first remix record, featuring up-and-coming heavy hitters LADYMONIX, Sol Power All-Stars, Pontchartrain, and Topher Horn. LADYMONIX, one of Detroit’s most recently exciting producers and deejays, kicks off the release with an east coast meets gospel garage house remix of Peter Croce’s “Revival”, before Washington DC’s Sol Power All-Stars turn up the groove on a brilliant afro fusion styled remix of Topher Horn’s “Photo For Todd”, loaded with plenty of hip-grooving percussive bounce and Mini Moog lines. Pontchartrain continues to dig into his peak hour deep house side, with his afro-Colombian-tinged remix of Peter Croce’s “Revival”. It features peak hour synth stabs, sax, and live alegre. Lastly, the ever jazzy and soulful Topher Horn digs back into his debut release and gives it the VIP rubdown, with heavier drums and bouncier disco-not-disco piano. Highly recommended diverse release for the discerning deejay and listener.